U.S. exports of the ethanol co-product distillers grains set a new record last year with China continuing to lead the demand. According to the latest government statistics, exports of distillers dried grains with solubles (DDGS) totaled a record 9.7 million metric tons (mmt) last year, up 31% from 2012 and well above the previous record of 9.0 mmt set in 2010. China was responsible for nearly half of the total – 46%, with Mexico and Canada a distant second and third. 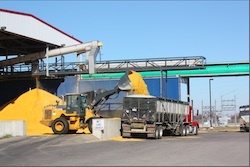 Credit for driving the demand for DDGS exports can be given to the U.S. Grains Council and the Renewable Fuels Association, which sponsor the Export Exchange every two years to bring buyers and sellers of coarse grains and ethanol co-products together. The event this year will be held October 20-22 in Seattle. Meanwhile, U.S. exports of ethanol were down a bit from the previous year, but at 621.5 million that’s still the third-highest annual total on record. Canada was by far the leading export market for the year, receiving 52% of the total. The Philippines ranked second, followed by Brazil, the United Arab Emirates, and Mexico. Meanwhile, U.S. ethanol imports were down 27% from 2012, making the United States a net exporter of 226.3 mg in 2013, roughly a 24% increase over 2012 net exports. Exports of both DDGS and ethanol from the United States are expected to continue to increase to meet demand, which could make up the difference if the EPA follows through on its proposal to lower the RFS.